The site being flat and comprising sandy clays over 3-5m depth of peat, over bedrock at depths ranging from 6-8m. In addition, planning conditions stipulated that the works should not impinge on the hydrogeology of the area. Given that the water table on the site is at existing ground level this effectively meant that all works had to be carried out above this level. 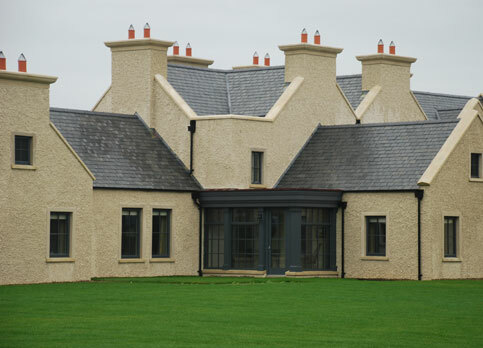 The site level was raised by an average depth of 1.5m with graded stone fill. All site services were constructed within the fill material to prevent the formation of drainage paths within the existing soil beneath. Ffoundations comprise 325mm thick reinforced concrete flat slabs supported on 350mm diameter CFA piles end bearing on rock. Roads and pavements were constructed of a sandwich of graded stone and geogrid. All primary drainage services were constructed on wide shallow precast ground beams bearing on unreinforced piles at approximately 4m centres. 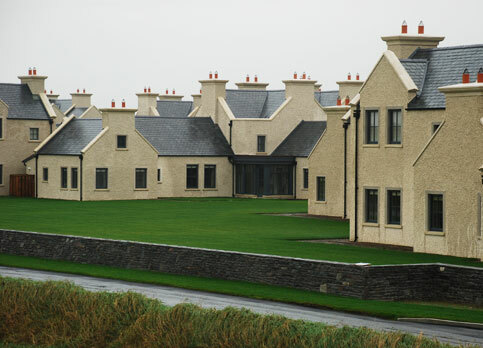 One of the principal challenges of the scheme was that, although each house contains four suites of an almost identical module, no two houses are the same, with the result that a unique set of drawings had to be prepared for each building on the site.